According to a legend dating back to the Tempou era, The Ise Daikagura and Shishimai were combined in this Kagura. The Shishimai and lead actor are separate and they dance to flute and drums. 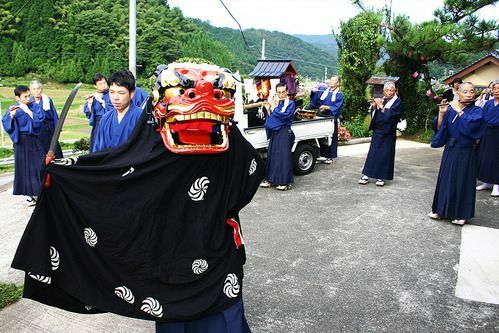 At the Utaosa shrine, there is a sword dance, and then the shishimai and actor travel around the town to perform for the villagers. This is an important tradition that is only performed in Utaosa and in Moroyose.